By nature, puppies are facultative carnivores - they thrive on a varied diet of meats with smaller amounts of fruits, vegetables and grasses. Biologically adapted to process proteins as an energy source, puppies need animal protein for healthy growth and building strong organs, skin and coat. 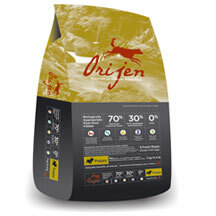 High in protein and low in carbohydrate, ORIJEN PUPPY has a grain-free formula that replicates the same rich and diverse balance of meats, fruits, vegetables and grasses that puppies and young dogs would encounter in a wilderness setting.